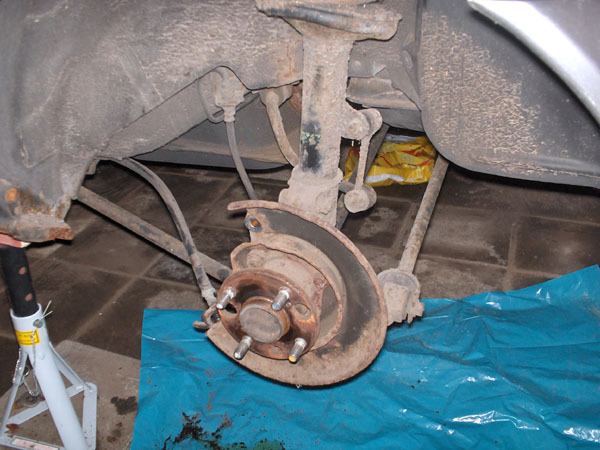 After the car was placed on axle stands and the wheels and brakes were removed, the suspension could be removed. 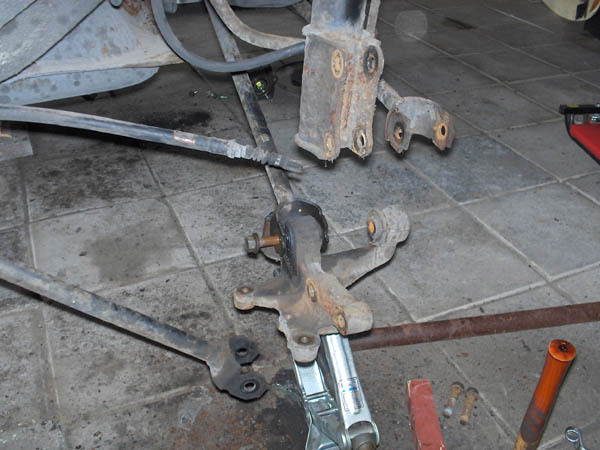 The front of the cars suspension is made of a McPherson strut and the back suspension is a so called multilink suspension with 2 cross arms and one longitudinal arm on each side holding the hub carrier in place. The front- and- read suspension on the drivers side. 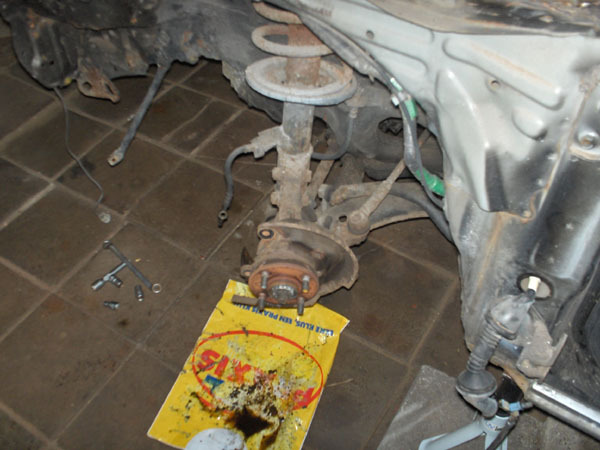 It is easy to remove the front struts. 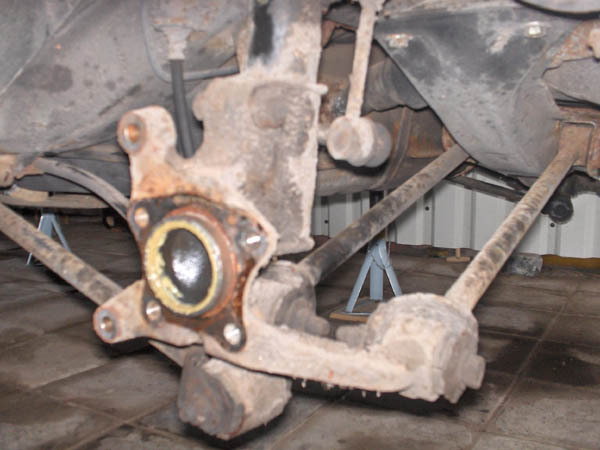 I simple matter of undoing 2 nuts and a bolt on the underside of the hub carrier, at the lower joint of the suspension arm. Another 3 nuts on the top side of the strut and with all removed, you can take the complete strut assembly from the car. The rear suspension is considerable more work (mostly because the bolts here usually don't cooperate) All the arms need to be unbolted from the hub carrier. These arms are held in place by large, long bolts. These go through metal bushings that are mounted in rubber bushings that sit in the hub carrier. Even the impact wrench had trouble getting these bolt loose, but they eventually gave way and came out...except for the last one of course. This bolt got stuck in the metal bushing and rotating the bolt only rotated the rubber bushing. It was stuck and wasn't going anywhere. Usually I would just cut those bolts in half and be done with it. But these suspension bolt have a certain size, strength and thread that I just can't pick up from the local hardware store. So I'd like them to remain intact. For now, I left it where it was and got the hub carrier and arms off together. I'll see how to remove that bolt later on. The resilient bolt that didn't want to be removed. When all the arms, hub carriers etc. 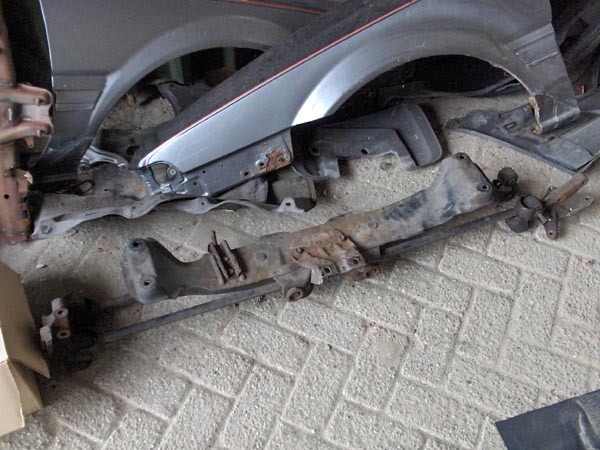 were removed, the subframes could be taken from the car as well. 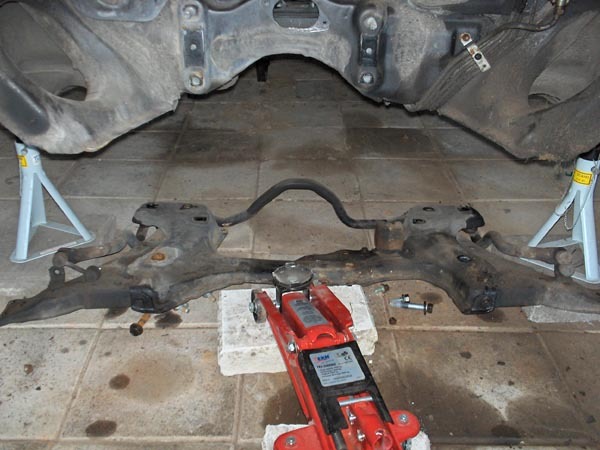 Both front and rear, there is a subframe bolted to the chassis of the car where all the suspension parts are fastened too. The front and rear sub frames removed. When these were removed, the dismantlement of the suspension was practically done and I can start looking in to what needs to be done to get the suspension back in pristine condition.